Beef with the sweet honey dressing, fresh radishes and lovely red cherry tomatoes. Seasonal, fresh colourful, healthy and very tasty! Make your dressing by adding all the ingredients together and whisking then season to taste. Heat up a char grill pan until hot, then add a little oil and add your trimmed asparagus and cook until just tender, set aside until later. Get your Ribeye steak, season with sea salt and place into the pan cook for 2-3 minutes on one side then turn over and cook for 2-3 minutes on the other side (medium rare) cook for longer if you want more well done. Once you’ve done this remove from the pan and allow to rest in a warm place for 5 minutes before serving. Slice your radishes into very thin slices then put in a bowl with your watercress or baby leaf salad. Slice your cherry tomatoes in half add to the bowl then drizzle your dressing over the salad and toss to mix together. 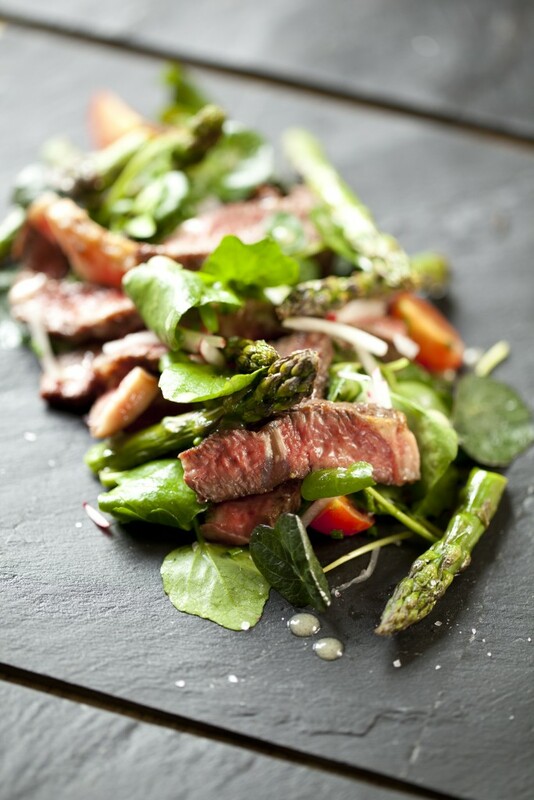 To serve place half of the dressed salad on each plate then slice the Ribeye into strips and share between the two plates and serve.